Visitation for Matilde C. Cobb, 93 of Long Grove, will be held on Thursday, April 11, 2019 from 9:00 am to 11:00 am at the Ahlgrim Family Funeral Home, 201 N. Northwest Hwy, Palatine. A Graveside Service will take place at St. Michael the Archangel Cemetery, 1185 W. Algonquin Road in Palatine at 11:45 am. Matilde “Mary” Cobb was born December 24, 1925 to Juan Cabanlit and Simeona Guanzon in a coral cave by the South Pacific Sea just outside of the small rural village of Caceres on the island of Cebu in the Philippines. Her father was a mariner and general handy and repairman who lived to 80, an old age for his era. Her parents were on the way to see a midwife for birthing and Mary could not wait. There are pictures of the cave which is really just an overhang eroded by waves pounding the coral. Simeona died and Juan had three more children by his second wife. Mary was the second oldest girl of the 10 chidren, evenly divided as five boys and five girls. She is survived by just one younger sister who resides in Mullan, Idaho. The family survived WWII and the Japanese occupation by taking to the mountains and growing their own food and harvesting the bounty of the sea. She recalled having to carry sacks of rice up into the hills on her head as a child. Her family was not really partisan, but some of the brothers fought the Japanese and some just tolerated them as was possible. Mary had a son, Felix Cabanlit born Nov. 11, 1943 which was originally Armistice Day and now changed to Veterans Day. He died in 2017 at age 73 after working for 25 years as a printer at Allstate. He was a bachelor. 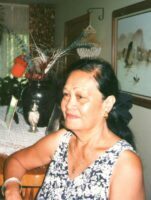 She is survived by numerous nephews and nieces in the Philippines and scattered across from the east to west coast in the USA. She moved from Cebu with some sisters to the island of Luzon and resided in Olongapo, Zambales near Subic Bay where the large US Naval base was built following WWII. She went to dress making school in Olongapo and is famous for crashing into a police car while taking a drivers education course there. And, yes she did drive our 36 foot RV’s on road trips in her 60’s. It was there she met Dave who was a Naval Officer and stationed at Subic Bay. It was love at first sight. Immigration laws and Navy regulations were very strict at that time. They waited until Dave was discharged and had a passport and visa before they were married on July 29, 1966 which will be 53 ago years this July. Dave had to write Illinois Senator Charles Percy and Speaker Henry Hyde to clear bureaucratic logjams preventing her immigration. She finally arrived in Illinois during very cold weather and spent her first hours in Evergreen Park sitting on one of the heat radiators in the front room of Mother Cobb’s house. To get warm! Dave was one of the first wave of computer software developers in Chicago and started working at Spiegel mail order catalog company. Mary who could never stay at home was soon looking for sewing jobs in Chicago. Dave and her moved to Seattle where they lived for a year before returning to Chicago for better employment. She finished off her naturalization classes and became a citizen in 1969 downtown Chicago. Mary worked at Universal Coverall on Van Buren Street for about 20 years before retiring. She commuted downtown on the Milwaukee Road train riding with a friend for many years. Dave followed into retirement in 1994. Mary took swimming classes and joined women at the Northbrook Senior Center in crocheting blankets for Linus Children’s Foundation. She was very fast. Exercise was her passion. Get up, check the day of the week for bike, treadmill or yoga followed by a 2 hour workout. That went on for thirty years until her heart valves failed on Memorial Day 2014. The onset of Alzheimer’s and Vertigo followed surgery. Dave and Mary were great travelers. There was plenty of time after retirement, and for 25 years they made use of it. They started in tents and as they aged they moved to motor homes, owning four RV’s which they used to tour 49 states. International travel to Mary’s home country the Philippine Islands was frequent. Six continents, many Asian Pacific countries, all over the Caribbean Islands, Central America, Europe, and the Holy Land – Israel gave her great joy and fulfillment. She was often reluctant to leave on a long trip, but once she got going it was hard to get her to end it. She and Dave had a blessed life together. Mary was such a sweetie and welcomed me into the group with opened arms. We enjoyed a wonderful trip to Niaghra Falls together with Dave and Mary and Tom and MaryJo. You will be missed, Sweet Mary. Rest In Peace. I will remember my aunt Mary with a good heart,a heart that always ready to forgive,a heart that always wanting to help very genorousity,not selfish.I will missed your smile,your laughed,and for always asking “do you want to go to chicago?”the question shes always ask.Say hi me to mom and papa.I LOVE YOU SO MUCH MAY YOUR SOUL REST IN PEACE. Mary and Dave were the soul of our Dive club for many years. Mary was a wonderful, warm hearted, sweet and caring person. She always was so excited to see each of us. She made each of us feel special. I remember on our dive trips she loved adventure, she loved food and would get to know all the cooks during the day, and in evenings she wanted to hear all about our dive adventures. She added so much happiness to every room she was in, to every table where she sat. We all wanted to sit at the table where Mary and Dave were. She was a treasure, a rare gem. We will dearly miss her. My thoughts and prayers are with you Mary and your family. We love out aunt mary for all the love and care she is giving to us family here in the philippines she will always remembered and respect not only for the help she is giving to us but for the unconditional love and i know she is with the lord in heaven because of her kind heart and beautiful person she will be missed and always in our heart. You will always be remembered no matter what, Your presence, love and kindness will forever be with us. Rest in peace aunt Mary. Love you and missed you. Mary was pure of heart. She adored children. She loved parties. To celebrate her gratitude for her recovery from breast cancer, she and Dave hosted the family at Thanksgiving for many years. We will miss her but the Angels are rejoicing.